Windows weatherproofing reduces the amount of energy used by 10-25 percent, and it reduces energy costs as well. Limiting the amount of air exchanges through windows weatherproofing can be done in a matter of minutes using easily installed tools. Weatherproofing the home is not as difficult as some might believe. You donâ€™t have to tear your home apart or spend thousands on professional in order to fix some existing problems. Reducing the amount of drafts that come into your home can be done with a few simple items and about an hour to spare. 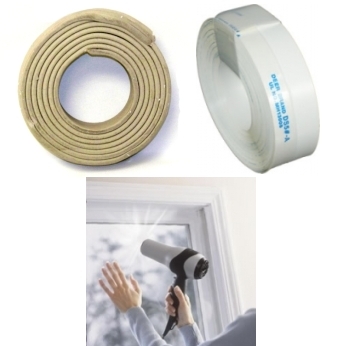 The items in a weatherization kit make sealing drafts simple, quick, and cost-effective. A weatherization kit is filled with items that make it harder for the cold air to come in, and the warm air to go out. 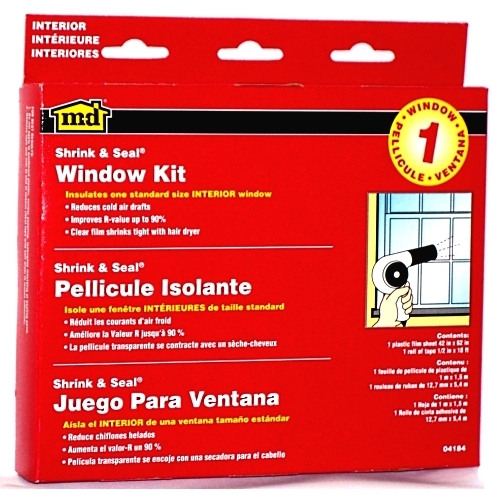 Shrink & Seal Window Kit â€“ Place the plastic from this kit over the windows, smoothing out any wrinkles by passing a hair dryer over it, and it keeps the cold air from coming through the window. 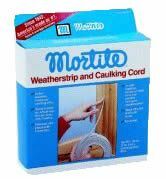 Replaceable Cord Weatherstrip â€“ Also used for windows, caulking rope is applied around the edges of windows, to cover the cracks and gaps that canâ€™t be reached with a caulking gun or tube. Insulating windows can reduce energy loss by 10 to 25 percent in the average home. 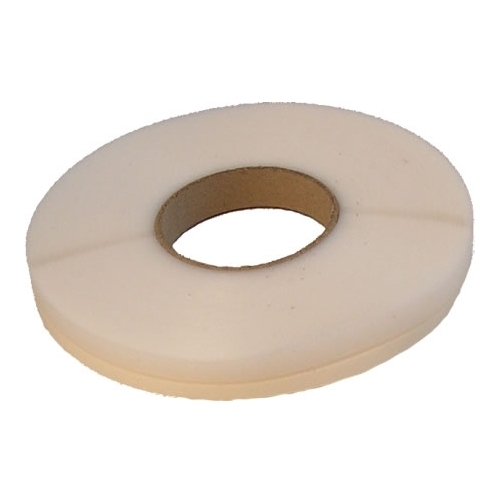 M-D High Density Foam Tape 02253 â€“ The closed cell foam tape reduces air infiltration from doors (and window sashes). Apply it to the clean, dry surface of door jambs, and cut off any excess. Doors make up as much as 11 percent of all heat loss in a home. Air easily slips in and out through doors that are not properly insulated. Foam Outlet and Switch Gaskets â€“ These handy little tools are placed behind the plate covers of electrical outlets and switches that are located on exterior walls. Stopping air from escaping here eliminates about 5 percent of total home energy loss. All of the items in a weatherization kit are low-cost, making the kit itself a low-cost investment. It is available for about $11, and pays for itself easily with the amount of energy that is saved during winter. Unplug the electric cord belonging to the air conditioner and wrap it closely, and tightly, around the front edge. Use a 3 inch piece of tape to keep it in place. Measure the height and width of the air conditioning unit. Add 6â€ to each measurement, and using a pair of scissors, cut the windblock liner accordingly. Place the insulating windblock front and center over the unit, folding and taping the square corners. The liner should cover the electric cord, plug, and the opening where the cord exits the AC unit. 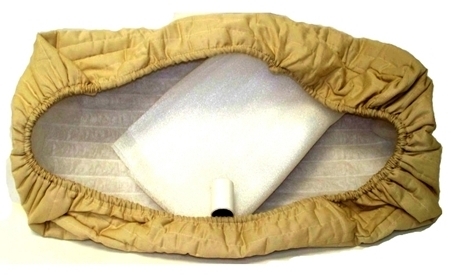 Place the fabric indoor air conditioner cover over the AC. The tape works best when the temperatures outside are above 35Â° Fahrenheit. Installing with a few simple steps, window air conditioner covers immediately get to work reducing the amount of air leaks experienced at the area where the AC is installed. Whenever there is a reduction in energy loss, a reduction in energy costs is sure to follow. Window air conditioner covers save money on heating during their first year of use, and can be used many winters after. Check out the pictures below for more detail on how installation is completed. In a home that lacks proper insulation, air leaks occur year-round. However, they are most easily felt during the winter months. For example, if you sit at a window that is poorly insulated, or place your hand to it, a draft can be felt coming into the home. With drafts come less comfort in the home, and more money spent on heating it. Weatherproofing windows can be done with tools such as rope caulk, v seal weatherstripping, and interior storm windows. These are all simple to install and capable of sealing air leaks without breaking the bank. Rope caulk is simply window putty that comes on a roll. Of the three tools, it is the simplest to install. To install, take a piece of the caulk, and press it into the window gaps with your fingers. Be sure to go around the entire window for the best results. The amount of rope caulk necessary depends on the size and number of windows that require insulation. Rope caulk is available in 35 ft., 45 ft., and 90 ft. rolls in both brown and grey, and costs between $2.50 and $5.80. V seal weatherstrip also comes on a roll, and is made of pre-scored polypropylene that has an adhesive backing on one half of it. Weatherproofing windows with this tool is done by first cleaning the surface where the sealant will be placed. Then, using a pair of scissors cut the v seal into the desired length, and press into place using your fingertips. The shape that is made with the sealant is a â€œVâ€ shape, hence the name. V seal weatherstrip comes in brown and white rolls of 17 ft. and 180 ft., and costs between $4.50 and $23.00. Apply tape to the designated places on the window. Place the plastic film over the window, and lightly against the tape. Lightly stretch the film, making sure to not stretch too much. Use a hair dryer to stretch the film. Do not let the dryer touch the film. This also gets rid of any wrinkles. Cut off any excess film. Using either of these tools, you can quickly seal out window drafts, reducing the amount of energy loss that occurs in the home. In addition, weatherproofing windows will help reduce the amount of money spent on heating the home, as windows account for 10%-25% of all home energy loss. Indoor air conditioners provide great relief from the hot air that summer brings. However, during the colder months of the year an indoor air conditioner becomes a source for drafts. When drafts come into a home, energy is lost, resulting in an increase in energy bills. Instead of ripping the unit out of the wall and covering that hole every winter, install window air conditioner covers over the AC unit. It is a simple way to insulate the air conditioner and increase the level of comfort in the home without increasing bills. A window air conditioner cover is made of a washable fabric, and comes with an adhesive seal and an insulating waterproof fiber sheet, which is placed on the inside of the fabric. The waterproof sheet protects the seal from extreme weather and keeps the air waterproof. With these tools, the cover fits perfectly over the unit that is being insulated to prevent any drafts from coming into the home through this source. There are a number of great ways to reduce unwanted air infiltration around the home. In addition to the v seal weatherstrip we discussed earlier, interior storm windows also help reduce the amount of cool air coming in through windows. However, instead of sealing cracks and gaps the way a v seal does,Â interior storm windows cover the entire window to add a layer of protection against the cold. Also referred to as vinyl storm windows, they are easy to install, effective, and low cost. This draft reduction tool comes in a variety of sizes to fit a variety of windows. To determine what the best fit for your home application would be, simply measure the length and width of your window, and find the vinyl storm windows that come closest to your measurements. It is best to choose a window kit that is above the measurements than below, as they can be cut to fit your needs. The plastic spline and plastic channels can be cut with a utility knife, while the vinyl size can be decreased with scissors. This type of window insulator is low cost, ranging from $7 to $11 in price. In addition, once the cold weather season has passed they can be taken down and reused the following winter using the same steps above. As a result, interior storm windows are ideal for any budget and any home, whether you are a homeowner or a renter. During extreme weather months, air easily slips in and out of the house through windows. When you have this unwanted exchange of air occurring, energy is lost. When energy is lost, the amount of control you have over indoor temperatures is decreased. As we close the door on summer and approach winter, consider installing a window insulation kit to reduce the amount of drafts coming into your home without breaking the bank. 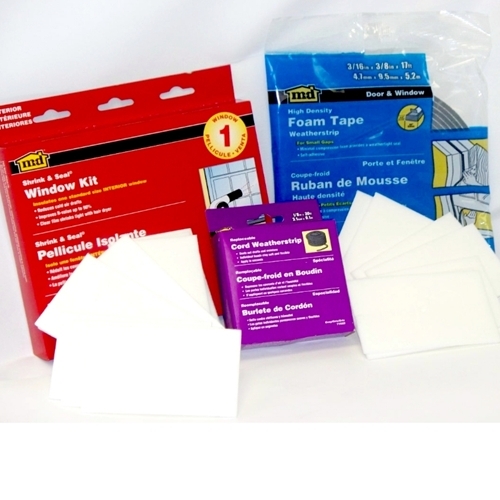 Unfold the film in the window insulation kit, and trim it enough to have a 2″ overlap on each side of the window. Remove paper from tape and lightly stretch and press the film along the top and bottom of the window. Once set, firmly press film to tape. Using the highest setting on a hair dryer, start at one corner of the film and pass over the entire film. Holding the dryer 1â€ away, shrink the film until wrinkles disappear. Costing approximately 6 dollars, a window insulation kit is simple to install as well as cost-effective. By creating dead air space, it can increase the windowâ€™s R-Value up to 90%. This type of window sealing helps to reduce the amount of drafts entering the home during winter, also reducing the amount of energy required to heat the home, and the amount of money spent on it. Pick a window in your house. When you place your hand to it do you feel a draft coming in? If you do, you are facing an insulation problem. Windows that are not properly insulated bring drafts in, and take money out of your wallet. Creating a tight seal around the windows allows you to save energy, maintain a comfortable temperature in the home, and reduce the amount of money spent on utility bills. V-seal weather stripping is among one of the most cost-effective tools that can be used to solve a window insulation problem. You may be wondering, “What is a V Seal?” V-seal weather stripping is a roll made of polypropylene used specifically to insulate windows and doors. The roll is as long as 180 feet. On one half of the seal is an adhesive backing for application. Choosing to insulate windows with this weatherstripping tool will costs as little as $23.00. It seals the window from those annoying drafts, helping to reduce the amount of energy loss (and costs) from the windows in a home. Choosing to insulate windows with a V-seal weather stripping is simple. Before installation, measure the window and clean the application surface. Once this has been done, use scissors to cut the V Seal to the appropriate length. Next, fold the piece that you have cut into the shape of a V. Remove the adhesive, and use your fingertips to place the seal on the cleaned surface. That’s all it takes. Barbeques are over, pools are closed, and kids are back in school, signaling the end of summer and the fast approach of winter. When you prepare for the winter season, do you prepare your home as well? If not, it is likely that your home is a source of wasted energy. Many are unaware that air leaks through windows are responsible for 10 percent to 25 percent of the household energy bill. Insulating the windows can be fast and affordable, allowing you to enjoy that â€œmost wonderful time of the yearâ€ without wasting energy and burning a hole in your wallet. 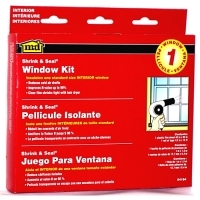 A storm window kit seals the front of the window with a plastic spine and channel system. To install, connect the ends of the channels around the window frame. Next, take the clear vinyl and use it to cover the face of the window. This should be held in place by the spline (plastic strip), which secures into the plastic channel. Simple as that! 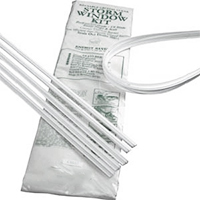 A storm window kit is not only easy to install, but cost-effective, costing as little as 7 dollars per kit. For just about a dollar less, you can invest in window insulation kits. They cover the entire window in order to eradicate drafts as well as the build-up of frost that is so common during winter. The clear film that comes in the window insulation kits should cover the window and sealed with double-sided tape to seal cracks and gaps. The plastic shrinks tightly, which allows for a clear, wrinkle-free fit. These kits increase the R-Value as much as 90% by creating dead air space. By far, the least expensive window insulation option is bubble wrap. With a spray bottle, spray water onto the window. Next, place the bubble side on the window. Using an exacto knife, get rid of the excess bubble wrap. This method of insulation works without staining the window and the bubble wrap remains there throughout winter having only water as a sticking agent. Although not as effective or aesthetically pleasing as the options above, it is the most cost-effective, and will take each windowâ€™s R-Value to 2. 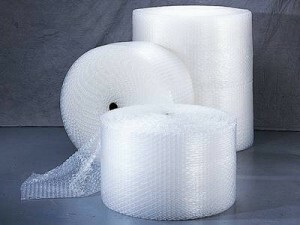 Next time you get a package lined with too much bubble wrap instead of throwing it away or scaring your kids with it, consider saving it for those cold days in winter. Windows can be a major source of drafts and heat loss, especially older windows and those with some gaps. Of course, replacing the window with more energy efficient windows such as double pane windows is the most effective way to lower your energy bills. However, this can be an expensive option, especially if you have a lot of windows. Morever, this might not be feasible if you’re living in a rented property e.g. apartment, condo or even house. So what can you do short of replacing the windows? Actually you can take several cheap but quite effective steps, to weatherproof you windows. 1. Install a plastic storm window. This project is cheap and should only take 1-2 hours. Here’s how it works: The plastic storm window kit consists of a plastic spline and channel system to create a seal in front of the window. The storm is installed by attaching the lengths of adhesive white plastic channels around the frame of the window. Simply cut the plastic to the correct size to cover the window. The plastic is held in place with a thin plastic strip (the “spline”) that locks into the channel. The seal is achieved in a way similar to that of a sealing plastic bag. If well maintained, this solution is reusable, unlike the plastic film that is simply stuck on the window with an adhesive tape. 2. Use a rope caulk around the edges of windows to reduce drafts and air coming in. It is installed by simply pressing it into place with your fingers. It’s easy to apply and easy to remove Rope caulk is a great solution for apartments. 3.Use a V Seal around windows. V-seal should be installed in the seams around the window frame so that create a firm seal when the window is closed.